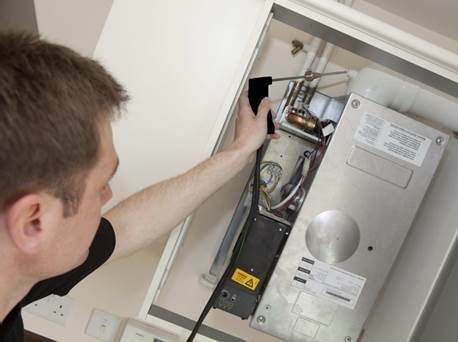 Following a small number of carbon monoxide (CO) related incidents with newly-commissioned condensing boilers, the Heating and Hotwater Industry Council (HHIC), with the collaboration of members and associated organisations, responded to concerns from government and Health and Safety Executive by developing a new CO testing procedure for use when commissioning a condensing boiler. This procedure was developed and put into place during 2013, and from April 2014 all UK boiler manufacturers who are members of HHIC made it a condition of warranty that CO level and combustion ratio must be measured and recorded on the Benchmark commissioning checklist supplied with every boiler sold in the UK. Along with this change, Gas Safe Register issued a technical bulletin (TB) on behalf of HHIC (TB 143 – CO and combustion ratio checks using an electronic combustion gas analyser (ECGA) when commissioning a condensing boiler incorporating air/gas ratio control valve technology). To help communicate this change, the TB describes in flow-chart format the testing procedure to be used for measuring CO and combustion ratio. TB 143 also outlines the requirements for ECGA use and underlines the need to complete the Benchmark commissioning checklist with the measured values at maximum and (where possible) minimum operating rate. The TB 143 CO testing procedure is coming up to its first anniversary and all the indications are that most of the early comments and concerns have now been resolved. One area of uncertainty arising from the original version of the guidance seems to have been around the use of the 350pmm CO ‘action level’ – below which the boiler may be considered to be operating safely. This has required a minor revision to TB 143. Boiler manufacturers have indicated that they would expect CO levels well below 350ppm for a correctly-installed boiler and they may therefore give a lower action level in their own instructions – which should be applied. The wording of the TB 143 flowchart has, therefore, been modified slightly to indicate that the CO levels specified in the manufacturer’s installation instructions take priority. For this reason, the 350ppm CO action level should only be applied if no commissioning level is specified by the boiler manufacturer in its instructions. More detailed information on the use of ECGAs in CO measurement is now available in the revised (2015) version of BS 7967 – Guide for the use of electronic portable combustion gas analysers for the measurement of CO in dwellings and the combustion performance of domestic gas‑fired appliance. With the use of ECGAs becoming more frequent it is vital to ensure that your ECGA is regularly serviced and calibrated in accordance with the manufacturer’s instructions. General information on the types of air/gas ratio (AGR) control valve found in condensing boilers and a description of their operation can be found in a revised (2015) version of TB 013 – Air/Gas ratio valves. This is intended for general guidance only and does not give updated information on all types of AGR control valve, which may be found. It will not be updated as boiler specifications change in future as general awareness of AGR control valves is now much greater among registered engineers. This, along with improved manufacture guidance, means that HHIC do not believe further information is necessary. TB 013 is not intended for use in place of the appliance manufacturer’s instructions for setting and adjustment. Once the CO level (in ppm) and combustion ratio have been measured, they should be recorded in the Benchmark commissioning checklist, which is left with the customer. This will then act as a record that the new boiler was operating safely and efficiently when left – useful reassurance for the customer and the engineer. Completion of the checklist also validates the boiler warranty, and in view of its importance as a commissioning document, Gas Safe Register will reject an installation for non-compliance if the required commissioning information is not correctly recorded. As ECGA testing of appliances increases, we have received reports that in some instances engineers are forgetting to replace the cap on the flue test point once the ECGA measurements have been completed. Remember – after testing; put your cap back on.